Darrelle Revis has played seven seasons in the NFL. 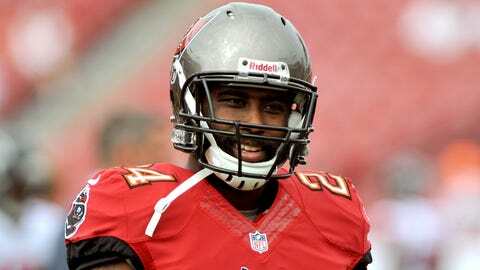 Darrelle Revis’ days in Tampa Bay could be numbered. The Buccaneers are stepping up efforts to trade the All-Pro cornerback, a source tells FOX Sports 1’s NFL insider Alex Marvez. In fact if the seventh-year cornerback isn’t traded by March 13, he’s expected to be released, Marvez and NFL on FOX insider Jay Glazer confirmed. While head coach Lovie Smith has praised Revis during his two months on the job, his astronomical price tag will likely make him a cap casualty. Revis, 28, is due to earn $13 million in base salary with a $1.5 million signing bonus through 2018. The Bucs acquired Revis last April for a 2013 first-round pick and a conditional fourth-rounder, which would become a third-rounder if Revis is on Tampa Bay’s roster Thursday.